WORLD champion and Olympic medal winning rowers, Paul (24) and Gary O'Donovan (25), arrived home to a heroes welcome in Cork tonight - but admitted their priority was a home-cooked meal complete with brown bread and spuds. The duo were welcomed by hundreds of family, friends, fans and members of Skibbereen Rowing Club as they arrived back at Cork Airport tonight fresh from their gold medal winning exploits at the World Rowing Championships in Bulgaria. They were also greeted by their parents and cousins who had gathered from all over Cork. The Skibbereen brothers helped deliver Cork's greatest ever world championship performance as, along with Ballincollig-based oars woman Sanita Puspure (36), they delivered a haul of three gold medals. While Sanita, her husband, Kaspar, and children, Patrick (11) and Daniela (10), flew back to Dublin Airport last night, Paul and Gary managed to catch an earlier flight back to Cork. President Michael D Higgins led tributes to all three athletes - and all will now be invited to Aras an Uachtarain. A joint 'homecoming party' will also be staged in Cork later this week for Paul, Gary and Sanita who are now major medal hopes for the 2020 Tokyo Games. The exhausted brothers, who arrived home via London, were just glad to be home. "It's been a great few days but we've been looking forward to getting home. It was tough training for the world championships but it was all worth it in the end." There's little time for a rest as the brothers are now scheduled at attend the National Ploughing Championships in Offaly. Cork's Lord Mayor Councillor Mick Finn and Cork County Mayor Councillor Patrick Gerard Murphy are now liaising with Irish rowing chiefs over how best to honour the three athletes. on September 25 next. The event has attracted a sell out 45,000 strong crowd. Councillor Finn has vowed to pass the proposal on to the event organisers: "I think it is a good idea." Ireland's first ever Olympic rowing medal at the Rio de Janeiro games. 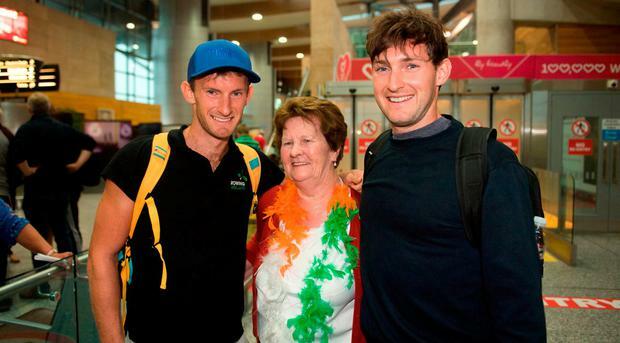 The O'Donovan brothers are expected to be accorded another special homecoming to Skibbereen to honour their heroics. In keeping with west Cork tradition, the brothers homecoming will be marked by special bonfires being lit on hills around the town.